Throughout its run, FX’s Archer has drawn numerous comparisons to Arrested Development. Archer’s seemingly endless string of running gags and punchlines that are delayed for episodes at a time inspire the kind of fervent attention to detail, re-watching, and Internet commenting that the short-lived (but briefly revived) comedy did before. One of Archer‘s greatest strengths is that it creates a real sense of community amongst its most diehard viewers while never sacrificing the more immediate laughs that appeal to a casual fan of the show. You can certainly turn on an Archer rerun and laugh at Pam’s forwardness or Archer’s profane charm, but there’s great reward in digging into the more nuanced, disguised elements of the show. 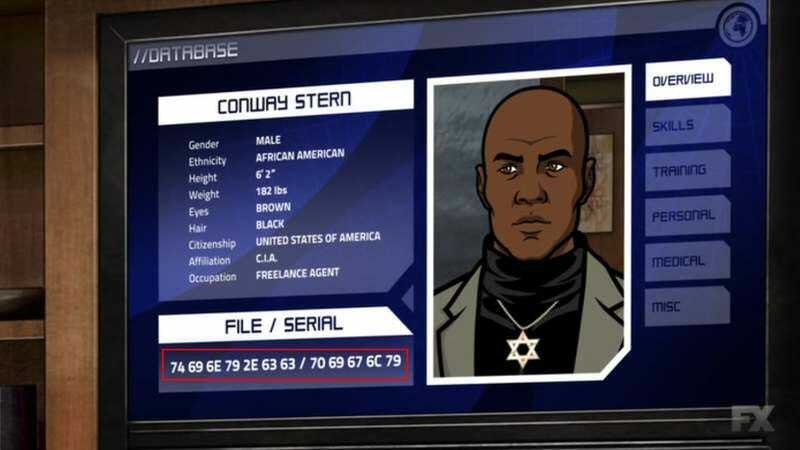 That kind of ardent, detail-oriented fandom may have reached its peak this week on imgur, where a user put in more work than anyone ever should to discover one of Archer‘s most deeply-hidden easter eggs. To explain every step in the process would be to spoil the joy of scrolling through the photoset, but it involves translating hexadecimal codes, Vigenère cipher encryption, examining a Craigslist ad, and a visit to a website created by Doctor Krieger himself. It’s a mind-boggling trip down a rabbit hole, one where it’s not so much the destination that’s satisfying, but rather the obsessive, convoluted, exhausting journey.